The Massachusetts State House, home of the Great and General Court (state legislature), dominates Beacon Hill and Boston Common with its gold dome. 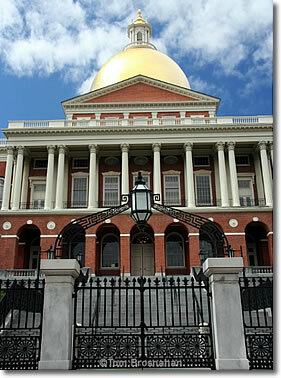 The Massachusetts State House, the state capitol of the Commonwealth of Massachusetts, was designed by Charles Bulfinch, Boston's most famous and best-loved architect, and finished in 1798. Located on the north side of Boston Common at the corner of Beacon and Park streets (map), it was the first building on Beacon Hill, which had earlier served as a cow pasture for governors of the colony. Guided tours of the State House are conducted by volunteers every weekday from 10 am to 4 pm (closed weekends and holidays), and show you its Doric Hall, Nurses Hall, Hall of Flags, Great Hall, House of Representatives, Senate chambers and Executive Offices. The rich marble decoration of the State House includes statues of important (and less important) historical figures, and glimpses of the state government at work. The Massachusetts State House on Beacon Hill, next to Boston Common, in Boston MA.